As this podcast gets beamed all around the world at Christmas, many of you will be spending quality time with your family. There will be 3-4 generations all under one roof, but take a look around, the senior citizens are the only ones not staring down at a device. Although the older and more experienced generation typically appreciates living in the moment rather than recording it, but are missing out? They are largely invisible from your group WhatsApp conversations and seldom get to see family photos. GrandPad is a simple and secure tablet computer that digitally connects older seniors to their family and friends. If your older parents have never used a computer or tried to use an iPad but it was too much work for you to get it working, GrandPad is what you need. Seniors can easily view family photos and videos, play games, see the weather for each family member, listen to music, email, make phone calls, video chat, and more. GrandPad arrives at the seniors home setup and ready to go. It includes wireless charging, no confusing choices, no passwords, no credit cards allowed. GrandPad is a fantastic example of a technology that is transforming how older adults 75+ are staying connected with their families and friends. While Amazon, Google, and Apple are marketing certain products for seniors, they’re missing the mark when it comes to design. A team of engineers are mentored by older adults, so the product is designed appropriately for those suffering from cognitive impairment, hearing loss, and dry fingertips, which are just a few of the issues adults encounter with age. 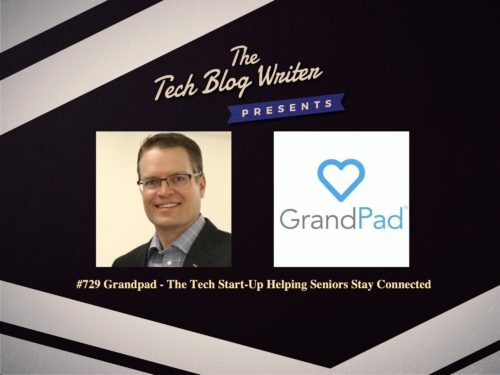 I invited GrandPad from CEO/co-founder, Scott Lien onto my daily tech podcast to learn more about this inspiring project that is helping seniors stay connected in a new digital world.